Schrodinger’s Heart – Love. Life. Practice. This is an adaptation of a column originally written for the Fearless Press site. If you’re interested in more interesting writing about sexuality in contemporary culture, I highly recommend it. Forget particles. It applies to our relationships too too. The romantic view of love is that you have a magical date where everything clicks and endorphins and woo squirm and wiggle out your eyes and into the gonads of your partner and suddenly the world has CHANGED. This is the person who who groks your hopes and desires and feeds them back to you. Your paths, however meandering, have been leading you both to this place and this moment at this time. The point of the experiment was that there was no way to predict whether or not the particle was emitted, the gas was released, and the cat was killed. In fact, as long as the box was closed, the cat was in a strange state of being both alive and dead. Part of the paradox is that only way to find out the poor feline’s fate was to open the damn box. At that point, you would know the cat’s fate. But here’s the real mind bender: if the emperiled feline could have been either alive or dead right up until you opened the box…wasn’t opening the box, in a way, the very thing that killed the darling creature? Any sensible person would say no, it was the particle with the poison. But Schrodinger was not a normal person, he was a scientist. Like most scientists, he was inherently romantic and I believe he was talking about us. Schrodinger’s heart, if you will. If you have a great date, you can know where you are. You can know where your partner is. But you can’t really know where you’re both going. This can become an agonizing state of uncertainty and bewilderment. Is this a meaningful relationship? Is it just endorphins? Am I really a [INSERT ROMANTIC ARCHETYPE] and are they really a [INSERT COMPLEMENTARY ROMANTIC ARCHETYPE]? Your mind and your heart and your emotions go up and down like a Hokusai painting, making Hamlet look like David Allen compared to you and your Heisenberg relationship and your Schrodinger’s heart. 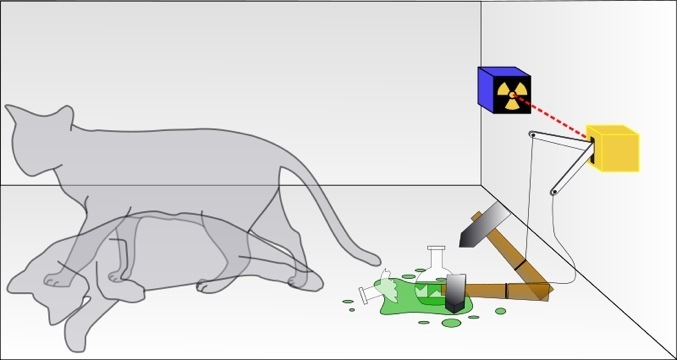 The only way to collapse that wave function – to really know where this wave of emotion is taking you – is to open the damn box, climb in and get down with the cat, the poison, and the glowing rock. Even if opening the box didn’t kill you, you sit in the box aware that at any moment that particle of doom may be released.